New York : Speak, 2011, Â©2010. 369, 16 pages ; 21 cm. All her life, Cassia has never had a choice. The Society dictates everything: when and how to play, where to work, where to live, what to eat and wear, when to die, and most importantly to Cassia as she turns 17, whom to marry. When she is Matched with her best friend Xander, things couldn&apos;t be more perfect. But why did her neighbor Ky&apos;s face show up on her match disk as well?. 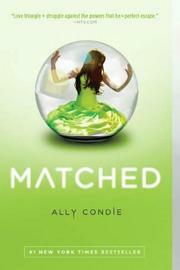 Condie, Allyson Braithwaite. Matched trilogy ; 1. 100 ME:PersonalName 1 $a Personal name Condie, Allyson Braithwaite. $c Statement of responsibility Ally Condie. $c Date of publication, dist, etc 2011, Â©2010. $v Vol. no./sequential designatn 1. 500 General Note $a General note Sequel: Crossed. 520 Summary $a Summary, etc. note All her life, Cassia has never had a choice. The Society dictates everything: when and how to play, where to work, where to live, what to eat and wear, when to die, and most importantly to Cassia as she turns 17, whom to marry. When she is Matched with her best friend Xander, things couldn&apos;t be more perfect. But why did her neighbor Ky&apos;s face show up on her match disk as well?. 655 IT:Genre 7 $a Genre/form data or focus term Young adult fiction. 655 IT:Genre 4 $a Genre/form data or focus term Young adult fiction. 655 IT:Genre 7 $a Genre/form data or focus term Young adult works. 800 SAE:PersonlName 1 $a Personal name Condie, Allyson Braithwaite.